Get unique and best Siri Remote charging stand. This post will give you very useful idea concern to charging Apple Siri remote control time to time. Just place your remote on the dock, and while you come back at your home, you will have a charged remote. So now, put your Apple Siri remote to charge with Griffin case, silicon case or other sturdy, rugged cases. Are you looking for branded and durable Siri Remote case? Then click on professional Siri Remote cases. Twelve south is South Carolina-based Apple accessories makers brand and popular in the United States. 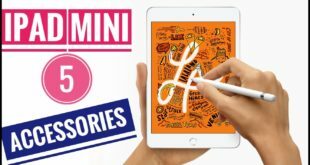 They always try to make best for Apple’s devices like iPhone, iPad, and iPod Touch accessories. 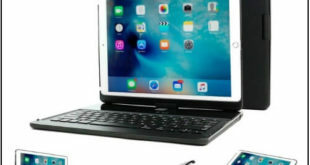 One of its universally available charging docks, it also works for Apple’s new launched Siri remote of Apple TV 4th generation & iPad Pro Apple pencil. Want to buy a stylish look and sleek designed nightstand and living room stand to charge and store your Siri Remote. 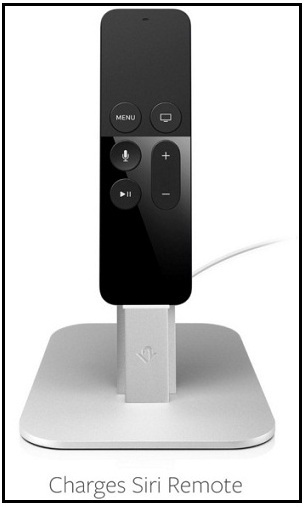 This HiRise dock is fully compatible for Apple TV Siri remote. It allows charging facility for Siri remote with the case, remote without cover very efficiently. In short, it’s an amazing Siri remote charging dock to organize charging cable. Available in many colors black, silver, Rose gold deluxe, gold deluxe, Silver deluxe. Pros: The sock is used to charge Apple’s almost 8-pin lighting cable devices such iPhone X, iPhone 8, iPhone 8 Plus, iPhone 7, iPhone 7 Plus iPhone 6S Plus to iPhone 5, iPad Air 2, iPad Mini 4 and earlier, iPod touch 6th & 5th generation, iPod nano 7th gene. Add to Cart: The Ultimate Pedestal for Siri remote. Do you know RND solution? It is a California located affordable price charging accessories selling the brand. 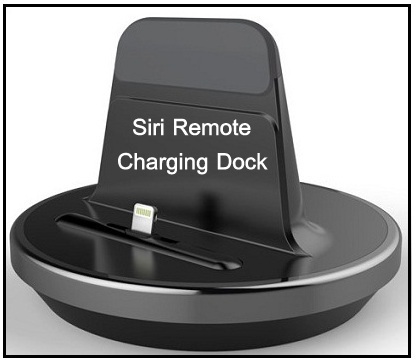 RND solution offer charging stand, an excellent management for Siri remote. An ideal charging dock for Siri remote made from highest quality plastic copper shielding and nickel-plated connectors. It provides stunning look on the desk and bedside tool. So from today your Siri remote never run out without battery life. So purchase it and get a 1-year warranty. Besides, RND offers hassle free warranty on its every professional retail packaging items. Box type designed Siri remote charging stand has made from solid aluminum while the bottom, top caps build from the silicon materials. Elago called this dock is D stand, best for use with lighting cable. Utilize a more convenient light cable management. Wonder useful for Apple TV Remote, iPad, iPad mini, Wireless Keyboard, Magic Mouse, etc. 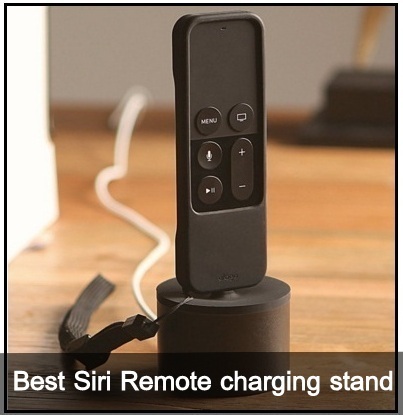 Do you have or found any best Siri Remote charging stand/ dock? Please share it in the comment box. If you are a seller and want to put your product review on this page, then feel free and contact us.